I’ve had RoadRunner high speed internet access for nearly a year now (7/2004-5/2004), and for 6 months of that year, I have experienced intermittent signal loss. What this means is that I lose my connection to the internet at random times and for no apparent reason (e.g., webpages don’t load, IM doesn’t work, downloads don’t work, etc.). Of course to me this is a problem, but I have had a hard time convincing RoadRunner that it is a problem. Much of what makes this problem tricky is that my ‘cable’ light on my modem stays on, which is supposed to indicate that the modem is receiving a signal and is connected to the RoadRunner network. As the technicians at RoadRunner have repeatedly pointed out, if the light is still on, I should have a connection. But I don’t. And, it is often the case that if I unplug my modem, then plug it back in (which is the only way to reset it), I can get the signal back, at least until it goes out again (which could be 5 minutes or 4 hours later). After nearly a year of complaining about this problem, I have finally been able to figure out what is really happening. The problem is that the strength of the signal making it to the modem is really, really low. But, there is a signal and it is high enough that the modem believes there is a connection, so the cable light stays on. I have fought with Roadrunner for six months to convince them that there is a problem, and that the problem isn’t on my end. I use a router to connect the four computers I have at home. RoadRunner first blamed my connection problems on that. I disconnected the router and still lost the signal. Then they said it might be my computers. But why would all four of my computers lose their connections simultaneously? They don’t all have bad Network Interface Cards (NICs), and I know that for a fact because two of them are laptops and they work when I take them to school. I do have to admit, however, that the technicians have admitted that my signal is low but they never seemed to think it was much of a problem and they definitely have never seemed to want to do anything about it. Now for the educational part… What does it mean when I (or the technicians) say my signal is low? From what I can gather, signal level is measured in dBmV (deciBel milliVolts; don’t ask me what this means, I don’t know). This site, and the last cable technician that came out to check my line, says that the recommended signal level is in the 0 to 2 dBmV range. My signal is -14.1 dBmV. Apparently, according to RoadRunner’s technicians, -14.1 qualifies as ‘low’ signal, but not a ‘bad’ signal. Of course, the technicians don’t want to admit that the result of my ‘low’ signal, is that I intermittently (and for no apparent reason), lose my signal. One website I found referred to this phenomenon as ‘losing synch’. Even though the technicians were telling me my signal was low, they weren’t actually talking in terms of numbers. They just kept speaking to me euphemistically about ‘low’ and ‘bad’, with no concrete information or numbers being passed to me, the consumer. This was bothersome and I really didn’t know what to do about it. After all, what do I know about cable signal levels? What’s more, the only way that the technicians had checked the signal level was to hook up a fancy gadget to my cable right where my modem plugged and and, voila, there was the signal level. But one technician actually spilled the beans about self-checking my signal level when he did it while I was on the phone with him from wherever he was located. Perhaps I should have known this was possible before he did it, but I didn’t. However, once I realized it was possible, I decided I wanted to know how to check it myself so I would have solid evidence for when I had to call for service again. So, what I have done below is outline how to self-check your modem’s signal level. It’s a little complicated and took me a while to figure out, but now that I know how to do it, I figured I’d share this with everyone else. Also, this is really only complicated because this particular type of modem does not broadcast its public IP page on the same network as the internet (if you don’t understand that, don’t worry, I don’t really either, but that’s how it makes sense to me). So, what you need to do is change your network settings so you are on the same network as your Toshiba modem (along with most other DOCSIS modems), then you can check its status and the corresponding signal level. This won’t tell you whether you are connected to the internet (a nifty program called PingPlotter will help with that), but it will tell you how crappy your signal is. You can then use this information to call RoadRunner and chew them out. 1. 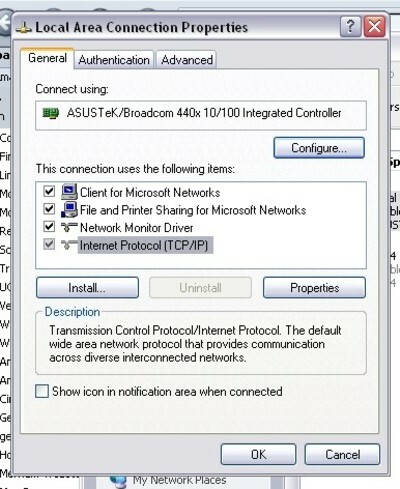 You need to connect directly to your modem, so plug the ethernet cable coming out of your modem directly into your computer’s NIC (network interface card). 7. That’s it. 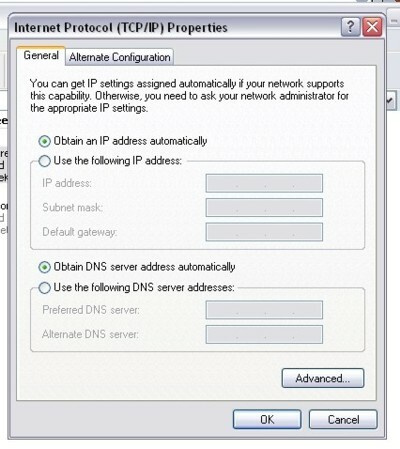 Once you have entered those numbers exactly, you can click ‘OK’ at the bottom of the ‘Internet Protocol (TCP/IP) Properties’ box and ‘Close’ on the ‘Local Area Connection Properties’ box. 9. This will tell you your signal strength (circled in red). If it is below 0, you’ve got a problem. You can then proceed to hound RoadRunner until they come rewire your house or whatever else is necessary in order for the problem to get fixed. Or, you can just do what we are probably going to do, get DSL. Extremely helpful! Thanks very much. Great information. I am having intermittent performance issues and of course the phone techs say they don’t see a problem. 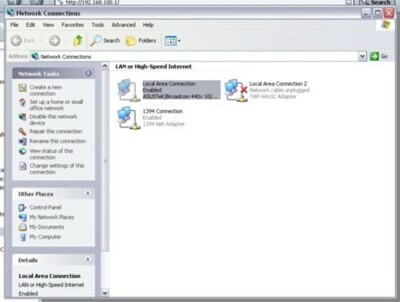 Did you ever do a bandwidth speed test when you had a low signal level? What were the results? It’s been a long time since I posted that item, but if I remember correctly I had a hard time doing bandwidth tests because the signal was so intermittent. Ergo, mixed results.